In a standing mixer fitted with flat beater, or in a large bowl with an electric hand mixer, place softened cream cheese. Beat cream cheese for a few seconds. Meanwhile, melt chocolate in microwave. Place semi-sweet chocolate chips in a microwave-safe bowl and microwave for 90 seconds at 70 percent power. Stir and continue to microwave for 30-second, then 15-second, intervals until chocolate chips are almost all melted. Stir until all chips are melted and mixture is smooth. Scrape chocolate into the mixer and blend with cream cheese. Mix in peppermint extract. Gradually stir in icing sugar. Place whole bowl in the refrigerator for an hour. Line two baking trays with wax paper. Remove truffle filling from refrigerator. Roll balls of filling between your palms and place on baking trays. The balls should be about 1 inch across. Melt the milk chocolate chips the same way you melted the semi-sweet chocolate chips. Drop a truffle into the chocolate, roll it around with a spoon, and lift it out of the chocolate with a fork. Tap fork on side of bowl a few times to remove excess chocolate, then slide truffle back on tray. Finish with the rest of the truffles and let chocolate set well, 1 to 2 hours at room temperature. To add decoration, melt the green molding wafers in the microwave as you did the chocolate. Pour into a disposable decorating bag (available at craft store) or a freezer zip-lock bag. Snip the tip of the bag and pipe your designs. Let set about 30 minutes. 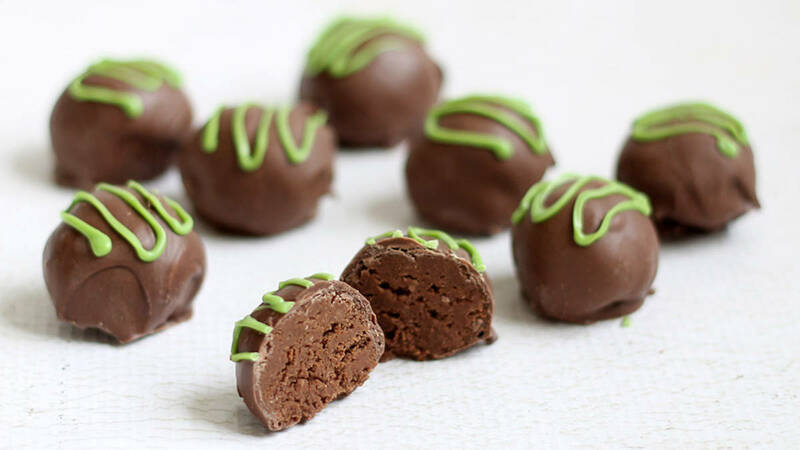 After chocolate is well set and before you add decoration, you can trim chocolate imperfections from the bottom of the truffles using a vegetable peeler.